What is Via Nebula like? Despite this being a game designed by Martin Wallace, Via Nebula is actually a very simple game. You spend your turns trying to complete various buildings. The game will end after a player constructs his/her 5th building. After one final turn, it is the player with the most points that claims victory. Points in the game come from 3 different sources. The first and most important way you score points is by erecting buildings. The second way you can get points is by placing craftsmen on exploration tokens (this will also unlock the resources needed to erect buildings). 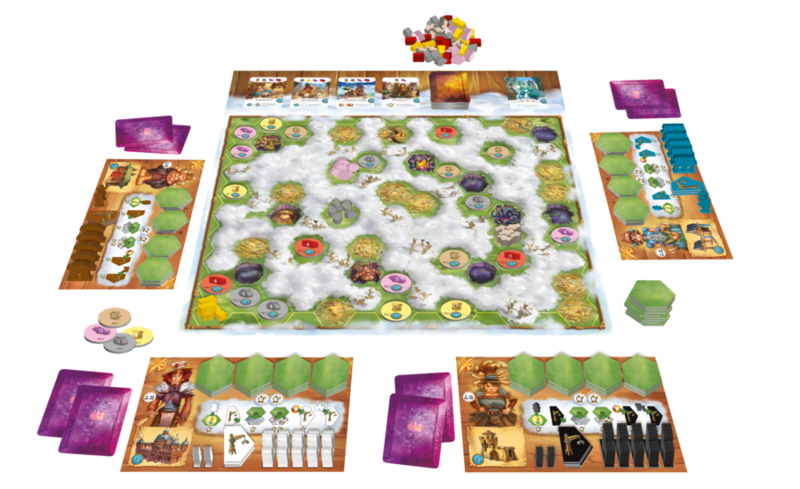 The third and final way you can score points is by exploring the board and clearing the fog. Players can either complete any of the 4 common builds available to all players on the main board. To construct a building players will first need to spend an action to place a building site. Then spend several actions moving resources to the site, and finally they have to spend an action to actually erect the building. Since players are limited to 2 actions each turn, it will take players multiple turns to get complete a building and score points. One of the interesting thing in Via Nebula is that fact the resources players need to construct their buildings are free for all players to take. They are free for anyone to grab. A player can spend an action to place a craftsman on an exploration title. This unlocks 3-4 resources of a given type (wood, stone, clay, wheat and little cute pigs that represent food). This will open up the resources to every player and give the player who did the unlocking, a few points. But to get the resources to your building site you need to be able to trace a “path” from your building site to the resource spot. You have to spend actions to build these “paths” and once build, they are usable by all players. As long as a player can trace a path from a resource to his construction site he/she is free to move a resource there. This combined with the fact that the 4 buildings that are available to construct require different resources and are on display for all too see creates a lot of wonderful tension. It’s a race to see who get’s them build first, and since players only take 2 actions each turn the other players can see what your up to and try to stop you. I think Via Nebula is a great game. It ticks so many boxes for me, it’s stunningly beautiful, has a great insert and clean simple rules. More importantly it is a lot of fun to play. It works great with all player counts (even the 2 player version is just as good as 3 and 4). While the rules are simple and easy to learn, the game is deep enough to keep even the game enthusiast interested. The double-side board is also a great addition with one side being more straight forward, and the other a lot more challenging. I really enjoy the shared resources and cleared paths. It makes most discussions really hard in a wonderful way, and makes it hard to do anything that doesn’t benefit other people. The game has a very simple set of rules. It’s very clear what actions are available to players at all times. For me the game also offers a lot of depth. You have to plan ahead and react to what your opponents are doing.